Dr. Chantelle Sephton's research program aims to find new therapeutic targets to slow or stop the development of devastating diseases such as amyotrophic lateral sclerosis and frontotemporal dementia. Dr. Sephton is particularly interested in the role of two proteins, named TDP-43 and FUS, that bind to RNA, the genetic material that is used to produce proteins. These RNA binding proteins play a crucial role in controlling the production of other proteins that are essential for the proper functioning of neurons. 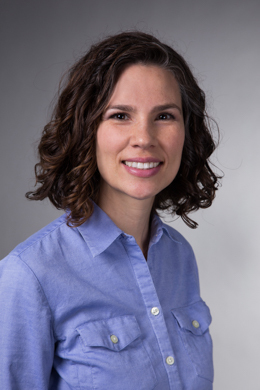 Dr. Sephton's research aims to understand the role of FUS and TDP-43 in regulating the protein production required for the formation of connections between neurons. The loss of connections, or synapses, is a central event in the development of neurodegenerative diseases. A better understanding of the mechanisms of production and maintenance of healthy synapses and neurons will identify intervention targets that could slow the loss of function associated with neurodegenerative diseases. The incidence of amyotrophic lateral sclerosis (ALS) and frontotemporal lobar dementia (FTLD) is growing in the aging population. From the time of diagnosis, the life expectancy is usually between two to 10 years. We have no cure or effective therapies for these diseases, because we do not understand the underlying disease mechanisms by which they occur. The loss of synapses is predicted to be an early event in the disease process and it occurs prior to neurodegeneration. Despite this fact, there have been few systematic studies that examine how synapse loss occurs or how disease-associated proteins contribute to loss of synaptic communication. RNA binding proteins are essential for maintaining synaptic homeostasis. My research program examines how the RNA-binding proteins, TDP-43 and FUS, regulate the production of essential proteins important for healthy neuron function. We are examining this using our novel mouse and neuron culture models employing biochemistry and imaging techniques. Our goal is to drive the field towards a better understanding of RNA regulation and its role in maintaining healthy neurons. The overreaching goal of my research is to search and identify better drug targets for the development of drugs to slow or prevent neurodegeneration. Finding better therapeutics will impact both the individuals who suffer from these diseases and their families. Sephton C.F. and Yu G. The Function of RNA Binding Proteins at the Synapse: Implications for Neurodegeneration. (2015) Cellular and Molecular Life Sciences. (2015) 72(19): 3621-3635. Sephton C.F., Tang A., Brooks M., West J., Kulkarni A., Stubblefield J., Liu Y., Zhang M.Q., Green C.B., Huber K.M., Huang E.J., Herz J., Yu G., Activity-Dependent FUS Dysregulation Disrupts Synaptic Homeostasis at Dendritic Spines. (2014) Proceedings of the National Academy of Sciences 111(44): E4769-78. Ward M.E., Taubes A., Bruce L Miller B.L., Chen R., Sephton C.F., Gelfand J.M., Boscardin J, Herl Martens L., Seeley W.W., Yu G., Herz J., Farese R.V., Green A., Gan L. Early retinal neurodegeneration and impaired Ran-mediated nuclear import of TDP-43 in progranulin-deficient FTLD. (2014) JEM, 211(10): 1937-1945. Cenik B., Sephton C.F., Cenik Kutluk B., Herz J., Yu G. Progranulin: A Proteolytically Processed Protein at the Crossroads of Inflammation and Neurodegeneration. (2012) Journal of Biological Chemistry 287(39): 32298-2306. Sephton C.F., Cenik B., Cenik Kutluk B., Herz J., Yu G. TDP-43 in CNS Development and Function: Clues to TDP-43-Associated Neurodegeneration. (2012) Biological Chemistry 393 (7): 589-94. Dewey C.M., Cenik B., Sephton C.F., Johnson B.A., Herz J., Yu G. TDP-43 Aggregation In Neurodegeneration: Are Stress Granules the Key? (2012) Brain Research 1462: 16-25. Sephton C.F., Cenik, C., Kucukural A., Dammer E.B., Cenik B., Han Y., Dewey C.M., Roth F.P., Herz J., Peng J., Moore M.J., Yu G Identification of Neuronal RNA Targets of TDP-43-Containing Ribonucleoprotein Complexes. (2011) Journal of Biological Chemistry 286 (2): 1204-15. Cenik B., Sephton C.F., Dewey C.M., Xian X., Wei S., Yu K., Niu W., Coppola G., Coughlin S.E., Lee S.E., Dries D.R., Almeida S., Geschwind D.H., Gao F.B., Miller B.L., Farese R.V. Jr., Posner B.A., Yu G., Herz J. Suberoylanilide Hydroxamic Acid (Vorinostat) Up-Regulates Progranulin Transcription: Rational Therapeutic Approach to Frontotemporal Dementia. (2011) Journal of Biological Chemistry 286 (18):16101-8. Dewey C.M., Cenik B., Sephton C.F., Dries D.R., Mayer P, Good S.K., Johnson B.A., Herz J., and Yu G. TDP-43 Is Directed to Stress Granules by Sorbitol, a Novel Physiological Osmotic and Oxidative Stressor. (2011) Molecular and Cellular Biology 31 (5): 1098-108. Sephton C.F., Good S.K., Atkin S., Dewey C.M., Mayer P., Herz J., Yu, G. TDP-43 is a Developmentally-Regulated Protein Essential for Early Embryonic Development. (2009) Journal of Biological Chemistry 285 (49): 6826-34. Sephton C.F., Zhang D., Lehmann T.M., Pennington P.R., Scheid M.P., Mousseau D.D. The Nuclear Localization of 3'-Phosphatidylinositide-Dependent Kinase-1 is Dependent on its Association with the Protein Tyrosine Phosphatase SHP-1. (2009) Cell Signalling 21 (11): 1634-44. Sephton C.F. and Yu G. Abeta Predictor of Alzheimer’s Disease. (2007) Archives of Neurology 65 (7): 875-6. Sephton C.F. and Mousseau D.D. The Dephosphorylation of Akt in C6 cells Grown in Serum-Free Conditions Corresponds with the Redistribution of p85/PI3K to the Nucleus. (2006) Journal of Neuroscience Research 86 (3): 675-82.